“If you go to a restaurant with a sommelier, the first seven minutes are very quiet,” said Ian Cauble, as he browsed mostly silently through an extensive wine list at Emeril’s, the celebrity chef’s flagship restaurant. 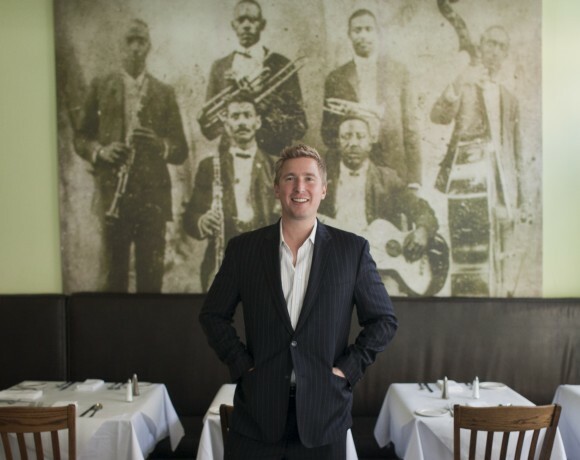 Mr. Cauble, 33, is one of the world’s youngest master sommeliers, and he was in New Orleans for the annual New Orleans Wine & Food Experience. Sitting at the wooden bar by the entrance at Emeril’s, Mr. Cauble and a fellow sommelier, Rajat Parr, fell silent for much longer than seven minutes. They pored over page after page of laminated sheets in a leather-bound maroon binder featuring hard-to-find, or “unicorn,” wines for more than two hours. “This is a great list!” said Mr. Parr, who ordered a 2002 bottle of Brézé for $225 and a bottle of Coche-Dury Meursault for $470 from the same year. After the restaurant’s own sommelier poured the wines, the men swirled them, sniffed them and smiled as they sipped. That ability, to taste a wine that is printed on a page, is a skill Mr. Cauble honed during more than a decade in the beverage industry. His title, master sommelier, not just sommelier, is something only 219 people have earned. The organization that grants the title, the Court of Master Sommeliers, was founded in Britain in 1977 to train, test and certify wine enthusiasts and professionals. After graduating in 2003 with a major in international business with an emphasis in wine business and Spanish, Mr. Cauble moved to the Douro Valley winemaking region of Portugal for a $2-an-hour job making port wine. When he returned to the United States a year later, he went to work at the Wine Merchant Beverly Hills under the supervision of Dennis Overstreet. There, Mr. Cauble said, he started to drink some of the best wines in the world, without understanding what they were. “It takes a very special and committed person to complete not only the advanced, but then to go on to the master’s exam,” said Kathleen Lewis, the executive director of the Court of Master Sommeliers, which has 28,560 members across all four levels internationally. The master’s test has three sections: theory, service and blind tasting. They all must be passed within three years. The theory portion is a verbal examination with 70 to 80 questions on the history of wine from other master sommeliers. For the next part, the candidate must serve mock customers at a restaurant. Finally, in the blind tasting, candidates must list everything possible about six wines, including the name, country, region, sub-region, village, grape varietal and year it was made — all within 25 minutes. 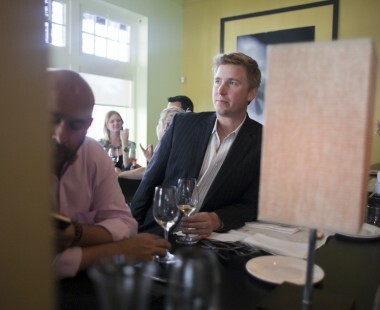 In 2012 at the age of 32, Mr. Cauble became the 197th master sommelier. His efforts were documented over three years in a film by Jason Wise, called “Somm.” The film has made Mr. Cauble famous in the world of wine; as he left a hotel to go to Emeril’s, a woman on the street stopped him to say she had seen the documentary. Mr. Cauble is what wine fans are really there to experience at events like the New Orleans wine festival, now in its 22nd year. David Kenney, a festival board member, said the hope is that inviting high-profile experts like Mr. Cauble will attract more people to New Orleans and the festival. “We’re trying to attract more trade people,” he said. Mr. Cauble recently launched SommSelect.com, a daily curated list of his favorite wines with a small description of their origin and suggested pairings. “It simplifies wine,” he said. “It’s not great if you can’t share it.” At Emeril’s he offered two men sitting next to him at the bar a taste of wine from his glass. Emeril’s was only one of many restaurants he visited in New Orleans. The night before, he said, he had visited six other restaurants and bars. “The city would not let me come home,” he said. At one of the restaurants, Mr. Cauble said, he found another great list with hundreds of “amazing” wines. “I drank Foradori, which is a pretty rare wine to see,” he said. But while he easily remembered the name of the wine, Mr. Cauble admitted he could no longer recall the name of the restaurant.